Last weekend there were a record number of OSCF qualifier tournament on a single weekend (5). Two of the tournaments are the largest qualifiers of the year, OHSCTA high school team championships (184 players) and Whitford/Cooper Mtn (169 players), so it’s no surprise that a record number of players competed in qualifiers on a single weekend (390). And the number of state championship finalists swelled from 298 to a near-record 400 with seven more weekends of qualifiers before State. The Oregon High School Chess Team Association (OHSCTA) held its 48th Annual state high school team championships. This year it was held far from Portland but still attracted 172 players, making it the biggest qualifier of the year! In the Varsity section, there was a four-way tie for first. By a razor-thin margin, it was Clackamas with the best tie-breaks, but OHSCTA decided to name Willamette, Crescent Valley, and La Salle as co-champs as well. In the JV section, it was Coquille in first with a perfect 5/5, followed by Willamette with 3.5 Tied for 3rd-4th were Pleasant Hill and Klammath Union. The individuals section was won by Joshua Duricka of Laurel Ridge Middle School with a perfect 5/5. Tying for 2nd-4th at 4/5 were Colby Perkins and Jamison Hermanson of Ponderosa Jr. High and Joshua Jacob from La Salle College Prep. Final results (not necessarily in tie-break order). Takuma Sato-Duncan plays a simul against younger players in the skittles room between rounds. 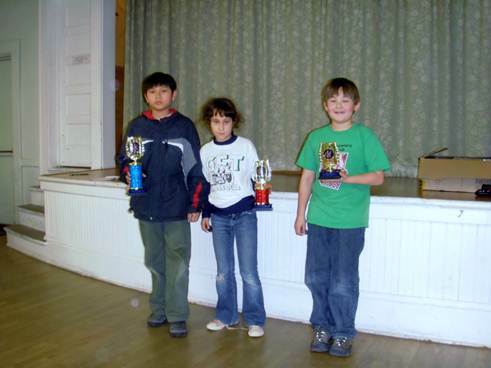 The eighth annual Whitford-Cooper Mountain Scholastic Chess Championships on Saturday, February 25th was the largest conventional qualifier tournament in the state this year with 170 players participating in six sections. Player skills ranged from the Elite 10 USCF-rated section (average rating 1509) to the “Pawns” section with unrated Kindergartners. Somewhat ominously, the day started with sleet, rain, some snow and blowing winds. However, Oregonians being a hardy bunch, there was only a slight delay in getting the sections running as the last few players were able to make it off snowed-in Sylvan hill and safely make their way to check in. After the Advanced and Intermediate sections started, the younger players in the novice sections were given a pictorial run through of tournament rules, from en passant, to touch move, to how to correctly adjust a piece. The Elite 10 had originally been planned as an Elite 8, but the 8th and 9th rated players had exactly the same rating (1455), so tournament director Rustam Kocher decided to add the 9th and 10th rated players to the section in order to solve the problem. An early start for the Elite 10 allowed them to finish their four rounds before the Intermediate sections wrapped up, indicating perhaps that some of the Elite games were played at a pace which was a little faster than anticipated or desired. The section (and the $100 prize) was won by Ashwin Sah (1531), who won all four matches on the day. Takuma Sato-Duncan won 2nd (and $50) with 2.5, while Aaron Pikus benefited from his brother’s largesse in the form of a draw in game 4 to land 3rd place with 2.5 and $30. The Kings, on the other hand, took their time playing their rounds, and were the last section to finish. 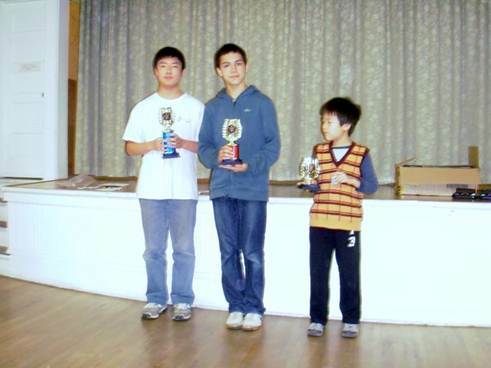 The section was won by Marshall Xu (1333) from Forest Park, with a perfect score of 5.0. Dmitri Murphy, Venkat Doddapaneni and Duncan Soiffer all earned 4.0, and landed 2nd, 3rd and 4th places based on tiebreakers. Forest Park had 25 students at the tournament, and cleaned up the team trophies, however the Kings section proved to be the exception on the day, as Stoller Middle School took first place with 8.5. Whitford was 2nd with 6.5. In the Rooks section, Forest Park Elementary surprisingly won the team competition in a section populated largely with middle school players. The section was won by Access Academy player Kian Patel (1062), who had a perfect 5.0 on the day. Beau Hamilton (1098), who almost missed the tournament due to a balky alarm clock, ended up with 2nd on the day, and Chris Pham and Daniel Fan took 3rd & 4th, respectively. Snowy Sylvan Middle School took 2nd in the section, while Whitford took home 3rd place. The Knights was the largest section of the day, with 41 players. Due to the large section, two players ended up with perfect scores on the day, but only Nate Hicken (856) took home the 1st place trophy. Nicholas Liskij (740) from Whitford was gracious in accepting his 2nd place despite the perfect day. Nathanial Lee and Nadia Siddiqui rounded out the top finishers with 4.0 scores on the day. Powered by Nicholas’ 5.0 score, Whitford won the team trophy for the Rooks, with a top score of 12. Forest Park earned 2nd with 10, while Robert Gray MS was hot on their heels with 9.5. 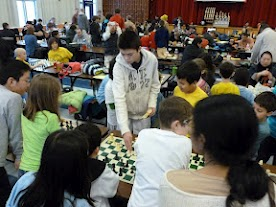 Both Novice sections were large, with many students playing in their first-ever rated tournament. The action was sometimes quick and harried, and at other times slow and introspective. As always, the best action was in the Novice rooms, since you can never tell what is going to happen next. Forest Park won both the Bishops and the Pawns sections, and both of them by wide margins. Winterhaven landed 2nd in Pawns, while Cooper Mountain took 3rd. In Bishops, 2nd went to Franciscan Earth Montessori , while Rieke Elementary took home 3rd. Forest Park swept the Pawns 1st-3rd: Jake Moleski, Calvin Ryu and Anna Rosenberg, with only Noah Brown from Winterhaven able to break into the top four. 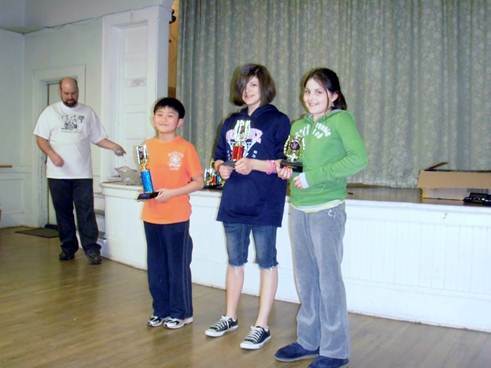 Bishops were also won by a Forest Park player, Scout Hawkey, while Winterhaven player Jin Yu was able to grab 2nd. Forest Park cleaned up 3rd and 4th with Declan Moore and Joe Schlechter. In all, almost everyone seemed to have a great time, the sun eventually came out and warmed everyone up, and the Kings section parents even voluntarily helped clean up the Skittles area while they waited for the section to finish. We hope to see everyone back again next year. Next year OHSCTA is adding a middle school section. This is a tremendous opportunity for middle school players to compete in a spectacular event with their friends and win a title for their school. The event will be held in the Portland area, probably in March. Details TBA. The Barber Tournament of K-8 Champions is the most prestigious tournament in the country for junior high school aged players. Each state may nominate only ONE player, so even getting an invitation to play in the tournament is a great honor. The winner of this year’s Middle School Elite section at the OSCF State championship in Seaside in April will be chosen to represent Oregon at this national event. As a bonus, this year’s event will be held in Vancouver, Washington in August. There is zero entry fee for the tournament, players are provided travel expenses by the organizer, and scholarships are offered to winners. In addition, Barber players are invited to play in the US Open (also in Vancouver at the same time) for 1/2 off the entry fee. Expect to see representatives from at least 45 different states at the Barber. 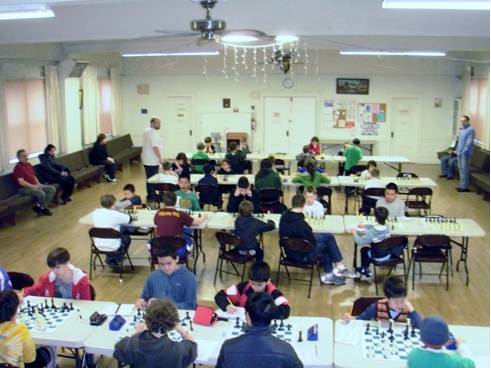 Forty-one scholastic chess players took one day of a three day weekend to try five rounds of competitive chess in a new venue. The Tigard Grange building dates back to 1925 but this is the first time in as long as anybody can remember that there were this many young families in the facility playing chess. The Portland Area League met on February 8th to play the 6th round of their three Division Round Robin. Division A League-leading Clackamas won on the odd boards to down Westview by a score of 3 to 2. Lake Oswego kept Wilson in the back of the pack by winning by a score of 3 1/2 to 1 1/2. LaSalle won the three middle boards to down Sylvan by a score of 3 to 2. Sylvan won the battle of the middle schools by downing Access Academy by a score of 3 to 2. In Division B, League-leading Cleveland could only draw their match against LaSalle #2. Sherwood had to forfeit their match against Lincoln due to transportation problems. Clackmas #2 and Lake Oswego played even on the first three boards, but they took the match by a score of 3 1/2 to 1 1/2 when the Lakers did not have players for the two bottom boards. Wilsonville won on first board against Access #2, but gave the match away by a score of 4 to 1 due to no shows. Division C leader Sherwood #2 was also a no-show (due to transportation problems) so they unfortunately forfeited their match against Cleveland #2. Sylvan #2 beat Wilson #2 by a score of 3 1/2 to 1 1/2. LaSalle #3 won on the first board against Jesuit #2 and took the rest by forfeit. 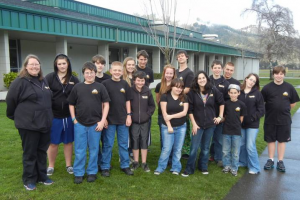 The Portland Area League met for the final matches of their season on February 15th. The League had been scheduled for 14 rounds, but decided to cancel the last round so that they would be completed prior to the Oregon High School Team Championship. Each of the final matches in Division A would determine a teams final standings. The Crusaders of Jesuit slipped by the Trojans of Wilson by a score of 3 to 2 taking 5th and leaving Wilson at the end of the pack. The LaSalle College Prep Falcons faced off against the kids from Sylvan. LaSalle needed a win to have any chance at moving up in the standings. Sylvan needed a win to place ahead of LaSalle. LaSalle took the match early winning on the bottom three boards. Sylvan won on the top board and the last game to finish was on board #2 when Sylvan’s Leo Deng who at one time had 2 minutes remaining on his clock to LaSalle’s Charlie Summers’ had 20 minutes remaining. The post ion was very complicated with Charlie having a Queen and two Rooks against Leo’s Queen, Rook, and Knight with both players having numerous pawns. Rooks were exchanged and Leo’s clock was under a minute and Charlie’s under five. With less than 30 seconds left on each clock Charlie’s Queen left the defense of his King to hunt down some pawns. With 11 seconds left Leo found a mating net as Charlie’s clock ran out of time. The Lakers of Lake Oswego needed to win their match against Westview to have any chance of catching Clackamas and to also stay ahead of LaSalle. Westview needed to win the match to keep from slipping further down the standings. The Lakers down the Wildcats of Westview by a score of 4 to 1. Division Leading Clackamas lost on board won but won the rest to take first place. In Division B Wilsonville was a no-show against Clackamas #2. The Cardinals of Lincoln edged out Lake Oswego #2 by a score of 3 to 2. LaSalle #2 ecked by Access #2 by winning on boards 1 and 3 and drawing on boards 4 and 5. The Cleveland Warriors proved their dominance in this section by blowing out the Bowman of Sherwood by a score of 5 to 0. Division C Wilson #2 played even against Cleveland #2 on the first three boards but got the last two by forfeit winning the match by a score of 3 1/2 to 1 1/2. Jesuit #2 took down Access #3 by a score of 3 to 1. Sherwood #2 won the top two boards against LaSalle #3 but gave away the last 3 games by forfeit. Board #1. Clemen Deng an 8th Grader at Sylvan with 11.5; Phillip Weiss a Freshman at Lincoln with 10.5, Bryce Eng a Senior at Jesuit and Dillion Murray a Freshman at Gresham playing for Wilson both with 9 wins. Board #2: Leo Deng a 6th Grader at Sylvan with 11, Ben Halverson a Junior at Cleveland wih 9.5, and Charlie Summers a Junior at LaSalle College Prep with 9 wins. Board #3: Varun Sah a Sophmore at Jesuit with 10, Cameron Fish a Junior at Cleveland with 9.5, Kyle Larkin a Freshman at Sherwood and Kevin Rhine a Junior at Clackamas with 8.5 wins. Board #4: Kevin Phuong a Senior at Clackamas, Lamson Vu a Junior at Westview, and Kian Patel a 7th grader at Access Academy each with 10.5, and Luke Meyer a Junior at Lincoln with 9.5 wins. Board #5: Sagnik Bhadra an 8th Grader at Sylvan with 10, Bryan Lucero a Junior at Clackamas with 8, and Curtis Bush a Junior at Sherwood with 7.5 wins. The Portland Area League is growing and we would like to see even more growth next year. This season we also offered an “extra rated game” section for those students that were brought as alternates or for those whose league opponents were no-shows and 115 students participated in these games. 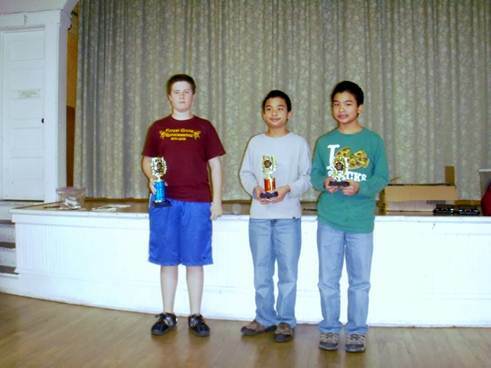 If your Middle School or High School has a chess club you really should consider joining in on the fun. If you don’t have an active chess club at your school that can join the League we also accept individaul players which will be assigned to teams based upon various factors. We will start up matches again for the next school year in November of 2012 so we really need to have teams and individuals committed to play by October 15, 2012. If you would like to join for next year or just want to know more about the League contact Ed Addis at chessalot@aol.com.